Ever since I began experimenting with gluten-free recipes, it seems like everyone I know, knows someone who is gluten-intolerant or celiac: friends of friends, my favorite local hairstylist, and – I recently found out – Stephanie’s sister. So when Stephanie asked if I’d like to guest-post and share a favorite chocolate chip cookie recipe with her readers, this one immediately came to mind, and I happily agreed. It’s everything I think a great chocolate chip cookie should be. The gooey, not-too-sweet dark chocolate complements the soft, brown-sugary-tasting dough, which in turn contrasts nicely against the salty crunch of the fleur de sel. In addition to being the best gluten-free chocolate chip cookie I’ve tried, this is also simply one of the best chocolate chip cookies I’ve ever had… period. I did a taste-test with my twins, my husband, my 11-year-old son and his three friends who happened to be at our house for the afternoon, and they all gave these cookies rave reviews. None of them noticed the absence of traditional wheat flour, and neither will you. I hope you will give these cookies a try, and that you enjoy them as much as we do. Thanks to Stephanie for inviting me to guest-post! I tried a few different flour combinations while developing this recipe, and this one was the best. The cookies come out a little crisp on the outside, soft and cakey on the inside. Bonus: you can also make these cookies dairy-free (by eliminating the butter, upping the shortening by an equal amount, and using gluten-free, dairy-free chocolate like this or this) and even cane sugar-free (by using grain-sweetened chocolate)! Lastly, note that the salty sprinkle really makes these cookies special… don’t skip it. 1. Preheat oven to 375°F. Line two large baking sheets with parchment paper; set aside. 2. Sift together the flours, potato starch, baking soda and xantham gum in a medium bowl; whisk in 1/2 teaspoon fleur de sel. 3. In the bowl of a stand mixer (or a large bowl if using a hand mixer), beat together shortening, butter and maple syrup at high speed until pale and smooth, 2 to 3 minutes. Add eggs one at a time, beating well after each. Mix in vanilla. Reduce mixer speed to low and add flour mixture a little at a time, mixing just until incorporated. Stir in chocolate chips and walnuts. The dough will be a bit softer than traditional wheat-flour cookie dough. 4. Place heaping tablespoons of dough two inches apart on baking sheets (I like to use a 1 1/4″ scoop). Sprinkle each ball of dough with a good pinch of fleur de sel. 5. Bake one sheet at a time on the middle rack for 9-12 minutes, just until golden. Cool cookies on baking sheet 1-2 minutes, then transfer cookies to a rack and cool completely. 6. Continue baking cookies, alternating baking sheets. You do not need to change the parchment paper between batches, but do allow the baking sheet to cool a bit before scooping the cooking dough. Store cooled cookies in an airtight container at room temp for up to a week. * If you prefer to make these without walnuts, increase the chocolate chips to 2 cups. 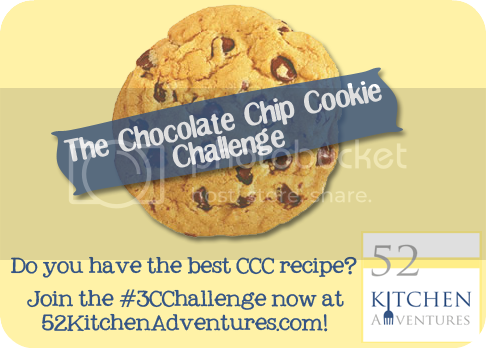 Click here to learn more about the CCC Challenge and how you can participate! They do look yummy! I would love to try and bake with gluten-free flours one day. Thanks for sharing! @Anna – I agree! Dawn did a great job with these cookies. Baking with GF flours can be really tricky and it’s something I want to get better at too. My daughter is allergic to tree nuts. Could I sub Sorghum flour for the Almond flour? Thanks you, this recipe looks great! @Christina – Unfortunately I don’t have a lot of expertise in using gluten free flours, so I’m not sure how substituting sorghum for almond will work. Sorry I can’t be more help! I can’t believe it! I made these a couple days ago thinking that I would be the only one eating them because they aren’t your typical chocolate chip cookie. Every time someone wanted to try one I said, “You probably won’t like it,” but everyone did! All three of my picky teenagers and even my husband who only likes “just plain ole chocolate chip cookies,” as he calls them, liked them. I left out the nuts and had to use cornstarch instead of potato starch since I didn’t have any potato starch. Oh, also ran out of maple syrup so had to use half agave nectar and still great. Almost didn’t put the salt on top but decided to try it and everyone liked it! The best gluten free chocolate chip cookie I have found so far! @Christina – Subbing in sorghum flour for the almond flour will slightly change the taste (and possibly the texture), but I bet these would still be great. I hope you’ll see this and give the recipe a try! BEST. (non paleo) gluten free chocolate cookie EVER. And I’ve thrown away a lot of gluten free cookies. These have crispy edges! I made a half recipe, in fear of once again wasting ingredients. I’m glad I did only because I only put 1/4 the maple syrup instead of 1/2. I thought it was too little, but instead of just rechecking the recipe, I added a Pyure. Still not sweet enough, but crisis averted at least! THANKS!